The avid book readers amongst you may recognise that the title is actually that of a 2006 horror novel written by Dean Vincent Carter which tells the story of a young journalist travelling to an island and becoming stranded where his nightmare begins, but this slot machine from Bally Technologies takes a more generic approach to the evil Devil who is regarded as the archenemy of God and humankind. Set on a fiery blood red background with bats and smoke flying across above the reels accompanied by dramatic sounds as the reels are spun, it mixes the Devil theme with playing cards but it lacks an animated Devil that would have greatly added some personality to the reels. Of course, it’s not the first Devil-themed slot available online but how does it compare against Novomatic’s Firestarter slot machine and the various others? With a setup of 5 reels and 30 paylines you’d assume betting options from 30p to £300 per spin but instead it’s going to cost you 40p to £400 per spin as you are required to pay an additional 10 coins to gain access to the bonus features – something which several players have expressed grave disappointment with and ultimately been put off playing the Hand of the Devil slot machine, but if your budget allows it, you can reap those coins back many times over in the free spins mode! The symbols on the reels have been designed in a slick Devilish style with a total of twelve that you’ll encounter. As with most online slots for real money, it’s the Wild symbol you’ll anticipate landing most as this is represented by the word WILD with fiery flames in its rear and this substitutes for all but the Scatter symbol, but it’s important to be aware that it doesn’t appear on the first reel. The Scatter is the Hand of the Devil logo and this is required for the free spins mode. Aside from these the special symbols are poker symbols consisting of suits and values. The suits see a Diamond enlaced with typical horns of a Devil, a fiery Spade with red Devil wings, a fiery Heart with pitch forks crossed over it and black Devil wings, plus a Club covered in cobwebs. There is also the standard Ace to 9 playing card symbols which have the smallest payouts of all. Get ready for some fiery action when three or more of the Scatter (‘Hand of the Devil’ logo) symbols appear anywhere on the reels as the reels turn extra hot for even greater wins! Unfortunately, like the free spins mode in the Havana Cubana slot machine, additional free spins cannot be triggered as they play out however you are presented with a total of 10 spins. In addition to this one of five sets of playing cards is randomly selected to act as additional Wilds, and these only appear on the second, third and fourth reels with varying values on offer between 1x and 5x depending on the set that was selected. To further add to the benefits these additional Wilds come stacked on the reels and once they land they are locked in place until the rest of your free spins play out in order to give you an even better opportunity of landing big combinations! Hell or Heaven to Play? 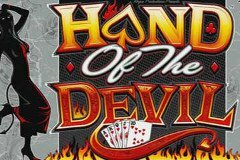 The Hand of the Devil slot machine is certainly not going to blow your mind but while there are several grievances with it, it does offer the opportunity for very big wins. The design and excitement of the reels could have been further improved by the inclusion of an animated Devil like 3D slot games offer and the fact you must pay an additional 10 coins for access to the bonus feature is quite astonishing, but thankfully there is a generous 94.02% return to player percentage and the free spins mode offers big wins thanks to the sticky stacked Wilds that can appear in the central three reels. All in all, it’s certainly worth a few spins and the greedy Devil won’t be taking too much of your cash!